The Ginza Willow Festival has been held on May 5th (Children’s Day) every year since 2006 to commemorate the planting of an orderly display of willow trees on Nishi Ginza-dori when it was designated as a symbolic road of Tokyo. We are holding the 13th Ginza Willow Festival this year as well, thanks to the outstanding support and cooperation of the Tsukiji Police Station, Chuo City, Tokyo and other government ministries and agencies, Tokyo Band Association, Ginza Association, Ginmikai (Ginza Merchant’s Association), Nishiginza-dori Association, all the performers, and other individuals who are involved in running the festival. This year’s Ginza Willow Festival is being held at the dawn of a new era as the new Emperor ascends to the imperial throne. With this in mind, this year’s theme is “flight”, as this change gives us an opportunity to soar into a brand-new future, and we would like visitors to experience this feeling through the festival’s parade and events. We sincerely hope that many visitors will attend and enjoy this year’s Ginza Willow Festival. Furthermore, as the day of the festival is a day when many people visiting Ginza can feel its unique hospitality and communication, we will make every effort to ensure that visitors can happily enjoy the festival in a safe, secure, and accident-free manner, and thus we kindly appreciate guidance, support, and cooperation from everyone involved in the festivities. Location: Nishi-ginza-dori, Sukiyabashi Park (2 locations), various buildings around Nishi-ginza-dori St.
Time: 12:00 to 1:30 p.m.
Grand parade by the Metropolitan Police Department and Tokyo Band Association. Enjoy powerful performances by marching bands and baton twirling clubs with the themes of traffic safety and “flight”. Beloved characters Hello Kitty and Peko-chan are also scheduled to appear on rickshaws. Members of the Japanese National Rugby Team who will represent the country in the Rugby World Cup this September, will also join the parade. This magnificent parade gives visitors an opportunity to discover, enjoy, and be inspired by the spirit of Ginza. Performances by about 15 top bands selected from the Tokyo Band Association at Sukiyabashi 5-chome Park. Enjoy powerful performances up close. Time: 11:00 a.m. to 5:00 p.m.
A space for the whole family from kids to adults to enjoy together. There will be traditional toys like spinning tops and “kendama” ball and cups and an open air Go class offering experiences that are rare for modern children. There will be appearances by Hello Kitty and Peko-chan who are loved by all. Hello Kitty appearance: (1) 2:30 p.m. (2) 4:00 p.m.
Peko-chan appearance: (1) 3:00 p.m. (2) 4:30 p.m. Participants in the Ginza Honey Bee Project to raise honeybees on the rooftops of buildings in Ginza will promote their “Ginza Honey.” Honey collected by Ginza honeybees has been praised for its unique flavor. Note: May finish earlier than 4:00 p.m. Powerful performance of traditional local dance. The Yosakoi performance that is a special feature every year is a major highlight. Space for experiencing activities with all five senses. Encounter culture and local specialties from Tokyo’s Hachijo-jima Islands while still within Ginza, surrounding yourself with an atmosphere that is different from Ginza in regular times. Visitors who answer quiz questions about each prefecture can win wonderful prizes. Enjoy informative tourism PR displays for places all over Japan along Nishi Ginza-dori. We can also expect for yuru-chara mascot characters to appear at the PR booths. Note: Photos are of last year’s events. Be welcomed to Ginza with a lively performance by Edo Ginza Kappore’s traditional Kappore dancing and the classic song “Ginza Ondo”. Under the slogan of “Increase Compassion, Reduce Accidents”, this event supports drivers’ efforts to reduce the number of traffic accidents. Residents who took part in the parade will also participate in a Smart Driver event in order to raise traffic safety awareness. Visitors can receive tips on vehicle safety checks and the proper way to ride. The Traffic Safety Campaign will raise awareness about traffic safety by acting out an actual accident in an intense performance. Shimbashi geisha culture performance in Ginza. Experience the Edo way of life and beauty of Japan in a dance by a geisha group that cannot usually be seen. Note: Photo for illustrative purposes only. Time: 2:00 to 4:30 p.m.
that were a lively part of the parade. Enjoy the scenery from and comfort of a rickshaw. Leading up to the Rugby World Cup hosted by Japan, this is a special booth at the Ginza Willow Festival that you could normally only find at Japanese National Rugby Team matches. Please come by and enjoy this chance to meet members of the Japanese National Rugby Team face-to-face. Tokyo’s Heaven Artists are back again this year. Tokyo’s official performers liven up spectators on the street. This is one of the most popular events every year. See the Heaven Artists’ websites for their programs for that day. An annual favorite event in which children create innovative and powerful art using tape with the road as their canvas. Please visit and take in this striking art. Receive a gift of a seedling of Ginza’s iconic willow tree. These are genuine Ginza willow seedlings directly trimmed from actual willow trees lining Nishi Ginza-dori and raised in a nursery. There will also be a display panel showing how to raise willow trees and the history of willow trees in Ginza. Please note: In case of rain, some events will be canceled. Street crossing by pedestrians will be restricted during the parade and some other events. 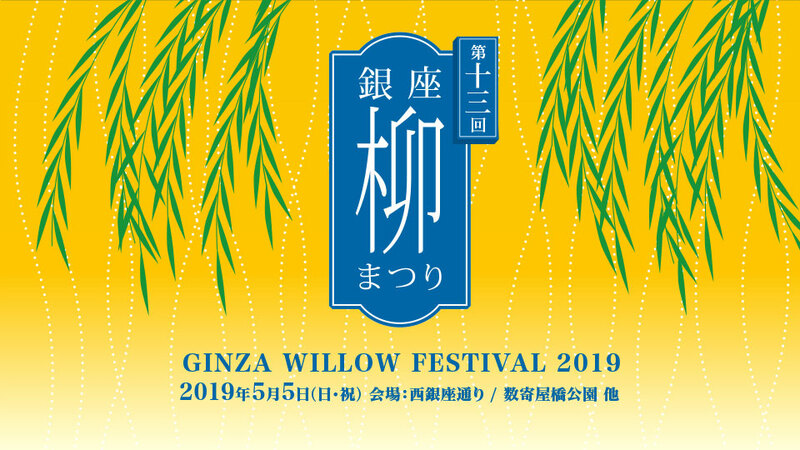 For details, please contact the Ginza Willow Festival Office.